Alterra Mountain Company has officially announced its 2018-2019 pass product, the Ikon Pass. 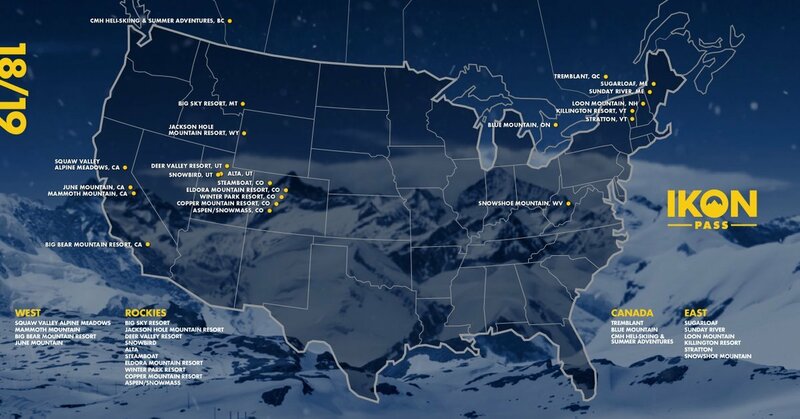 North America’s top mountain destinations have joined together to offer skiers and riders the Ikon Pass uniting 12 destinations from Alterra Mountain Company and 11 premier destination partners. The Ikon Pass is a collaboration of seven industry leaders - Alterra Mountain Company, Aspen Skiing Company, Alta Ski Area, Boyne Resorts, Jackson Hole Mountain Resort, POWDR, and Snowbird. Each demonstrates integrity, character, and independence that is reflected in their mountains and guests. Alterra Mountain Company’s destinations are Steamboat, Winter Park Resort, Squaw Valley Alpine Meadows, Mammoth Mountain, June Mountain, Big Bear Mountain Resort, Stratton, Snowshoe, Tremblant, Blue Mountain, Deer Valley Resort, and CMH Heli-Skiing & Summer Adventures. Ikon Pass partner destinations are Aspen Snowmass, Copper Mountain Resort, Eldora Mountain Resort, Jackson Hole Mountain Resort, Big Sky Resort, Killington Resort, Sunday River, Sugarloaf, Loon Mountain Resort, Alta Ski Area, and Snowbird. "The Ikon Pass is a collaboration of like-minded mountain destinations across North America where incredible terrain, unique character, and local traditions are celebrated," said Erik Forsell, Chief Marketing Officer for Alterra Mountain Company. "We’ve curated a community of iconic destinations. We believe this new pass offers tremendous opportunity and appeal to mountain enthusiasts who have a passion for outdoor adventure." The Ikon Pass will go on sale in the spring of 2018 and additional information including access specifics by destination, price, sale date, and other pass product details will be announced in the coming weeks. Please visit www.ikonpass.com for more information.